Minimally invasive spine is a broad term used for group of treatment procedure with minimizing incisions to reduce trauma to the body. This type of procedure is usually performed using thin-needles and an advance endoscope to visually guide the procedure. 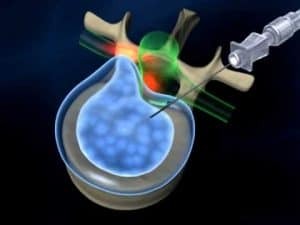 Now, because of advanced scientific technology and miniaturization, including fiber optics, video imaging technology, and experience gained through minimally invasive spinal procedures, there is a less traumatic discectomy procedure for some patients with disc problems. The goal of minimally invasive spine procedure is to reduce postoperative pain and blood loss, speed recovery, and less scarring. 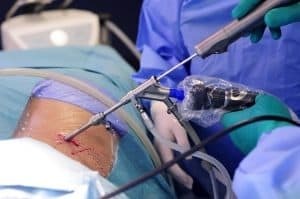 In an effort to overcome the disadvantages of traditional surgical techniques, the scientific community began exploring the use of endoscopy (arthroscopy) for spine. An endoscope (HD camera with rod lens) provides clear visualization and magnification of deep structures. This technology, first used in knee surgery & now has been astonishingly successful in relieving spine pain. • Endoscopic discectomy – is a minimally invasive spine procedure, which allows us to treat any problematic disc more safely with great success rate than open spine surgery. Endoscopic discectomy has proved of value not only for discectomy but also for many other back problems. With this minimally invasive technique all kinds of back & neck pain can be addressed in a very tissue-preserving way. • Endoscopic Foraminotomy – is a minimally invasive spine procedure used to relieve pressure to spinal nerve roots, caused by compression from bone spurs, disc herniations, scar tissue, or excessive ligaments. • Endoscopic facet rhizotomy – an advanced minimally invasive spine procedure alleviating pain coming from facet joint syndrome or spine arthritis. • Kyphoplasty and Vertebroplasty – are both minimally invasive procedures that can treat osteoporotic fractures. The method is to stabilize crushed vertebrae by injecting an acrylic cement into the vertebra. 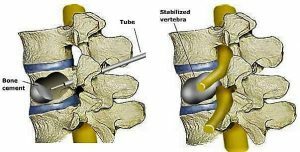 Vertebroplasty is effective in relieving pain, most likely because of the added support and stability it provides the spine. 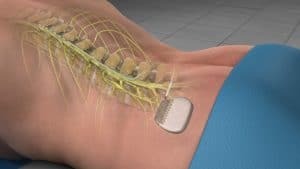 • Spinal Cord Stimulation (SCS) – an implanted electrical device that decreases the perception of pain by confusing the spinal cord and brain pain processing centers. Initially, a trial is done to see if this device will help you long-term. In the initial trial, your pain physician places a small electrical lead in the epidural space through a needle. Painful signals are replaced by tingling electrical signals. If you have success in your trial, you may decide to have a permanent SCS device implanted. • Peripheral Nerve Stimulation – this method involves tiny electrodes being placed close to the affected nerves. The electrodes release a small electrical current that inhibits pain transmission and causes pain relief. • Intrathecal Pump Implants – Implanted pain pumps are also available which can be extremely helpful providing long-term pain control. The effectiveness of intrathecal therapy in patients suffering from nociceptive pain showed a pain reduction in 66.7% of patients experiencing pain due to cancer (Becker 2000). • Nucleoplasty: Disc Nucleoplasty therapy is designed to reduce the tissue volume of the spinal disc by evaporating part of the liquid core, this lowers the pressure on the walls of the spinal disc, which in turn reduces the painful protrusion of the disc. There are many different minimally invasive spine procedures for back pain. The goal of nearly all procedure is to remove pressure from the nerves of the spine, stop excessive motion between two or more vertebrae or restores the function of spine. The type of Procedure that is best depends on that patient’s conditions and symptoms. Consult Spinomax pain & spine clinic for Advanced Minimally invasive spine treatment for you.